I have been seeing lots since July I just don't seem to have posted anything on the blog as I tend to use Instagram more as it is instant, I'm Salamanda001 if you are looking for me there. 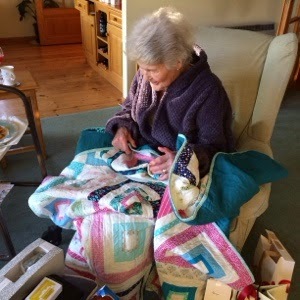 Much of my time has been taken up with English Paper Piecing projects as I like the portability of them and the ability to sit and listen to music, watch TV or chat whilst sewing. The other reason I have not blogged is that my camera is broken and I'm saving up to buy a new one so please excuse the iPhone photos. 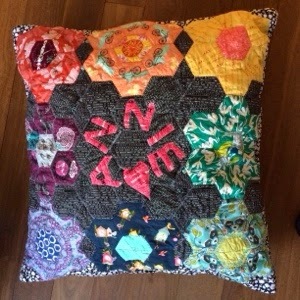 The large floor cushion was made for my niece's Christmas. 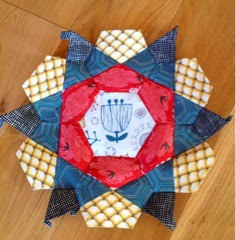 This was a mini quilt I made for the instagram swap which was inspired by a piece of stained glass window. 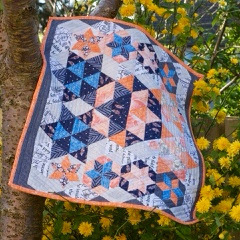 I created a simple pattern for squares in squares alternating with cream, each block finished at 12.5 inches and I used Quilt as you go as I couldn't imagine getting it through my machine. The colour choice was what mum wanted, perhaps too much pink and cream for me. 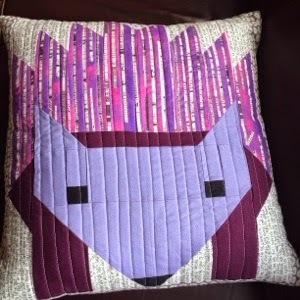 Hazel Hedgehog using Elizabeth Hartman's pattern was completed last month for my eldest daughter who needed more cushions for her uni flat. 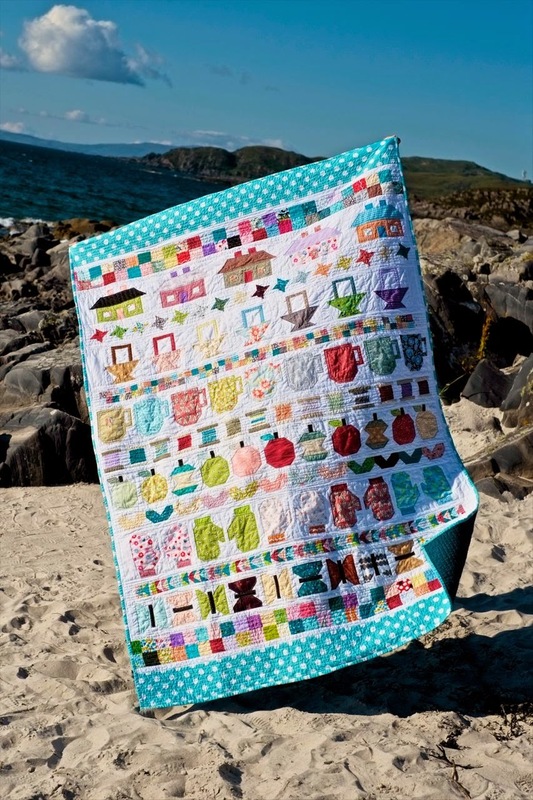 However my latest obsession is La Passacglia quilt from Willyne Hammerstein's book "millefiori quilts". I hope to have a new camera soon and resume normal services. 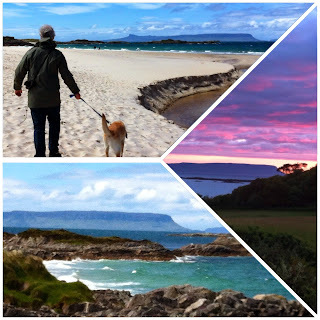 This is a photo heavy post as I could not resist taking advantage of our beautiful location at Camusdarach Beach, Arisaig on the West Highland Coast of Scotland. This quilt has been a long time in the making. 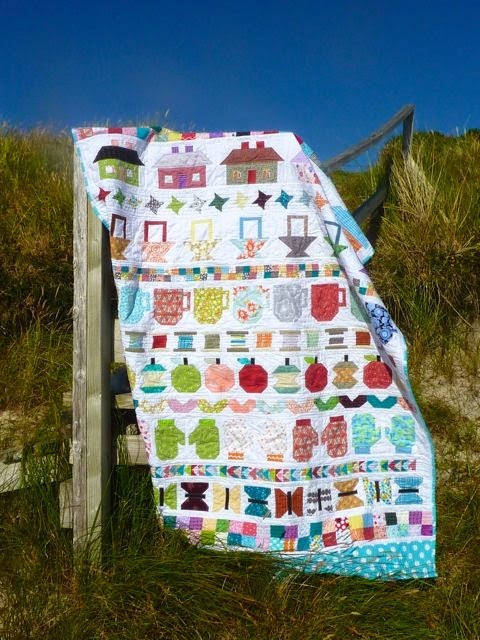 It began when Lori Holt of Bee in My Bonnet hosted a Row along back in 2012 and I decided from the beginning that this would be a quilt I made for a charity. It all went well for a while and then life got in the way and the Row along finished. 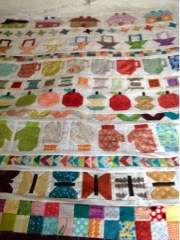 This time last year I inexpertly pieced the rows together in anticipation of finishing the quilt. However various bits of life got in the way and it was only about a month ago after see all the quilts popping up for Siblings Together that I decided to get down to work. You can find out about the charity and the great work done by Lilysquilts by following this link for Siblings Together. When it came to finishing up the quilt I didn't have the information for the rows (as the row along was finished) so I decided to make mine up, three failed attempts - that I shared on Instagram - and I just went with patchwork squares. 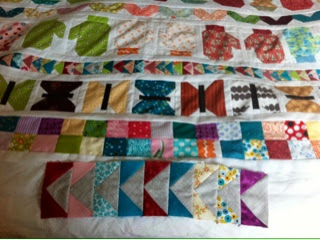 I used scraps to make the quilt. My other problem was that the white I used for the background was finished and I had no idea what colour of white it was. After various fruitless searches I admitted defeat and decided to add the Riley Blake dots top and bottom and for the binding. The backing is a solid green teal and was bought for another partly finished quilt but it can wait. Quilting this pushed my very limited skills. I first quilted horizontal lines along the white sashing and then the smaller rows. I decided to try quilting just inside the shapes to define them and add some interest to the back. It took ages and was a real wrestling match between me, the machine and the quilt but it was so much easier on my new Janome and I used variegated aurifil thread which was fantastic. This is the first time I have sewn sitting down since the back operation and it went well. I've almost stopped all pain meds and have so much more mobility which is fantastic and something I couldn't even imagine 3 months ago. 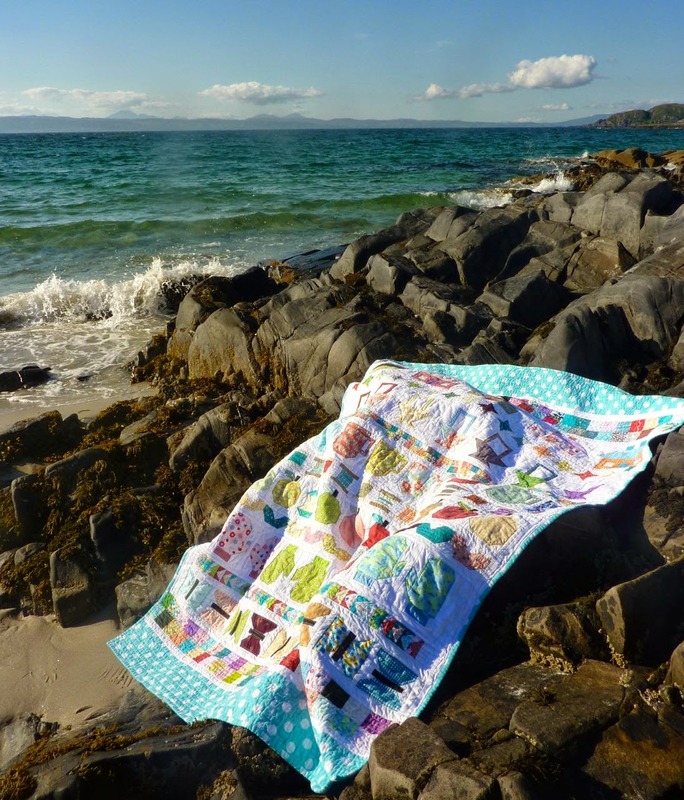 We are currently on holiday at my favourite place, Camusdarach beach, Arisaig and there have been some wonderful sunny days and some very wet days which has not been a problem as I'm able to sew for as long as I want. I have made progress with my English paper piecing and some of the stars are now cushions which I will post in a separate blog post. 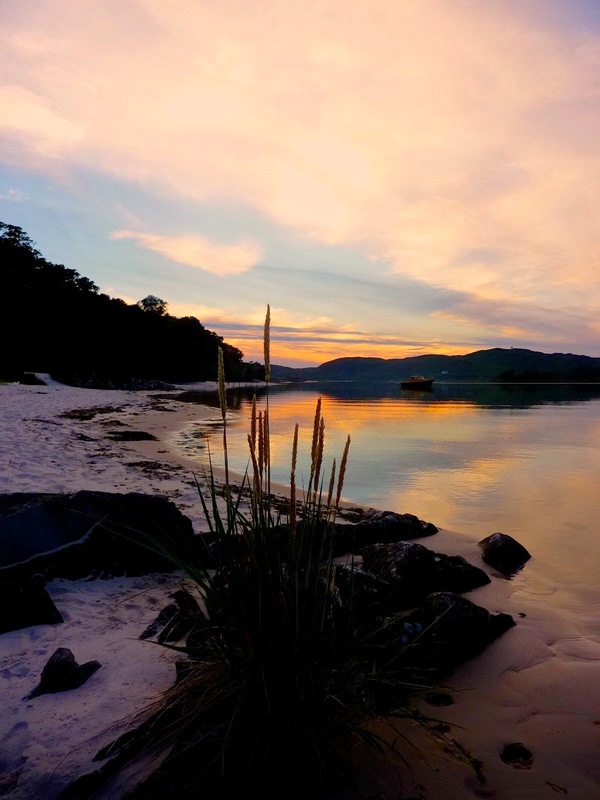 There have been some spectacular sunsets, the photo below was taken at the White Sands of Morar. 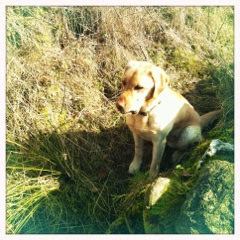 Thank you for dropping by and if you want to see some of my work in progress and photos of Jaspar the daft labrador you can find me on Instagram as Salamanda001. I am continuing to sew my Rose Stars and have now finished number 5 and still can't decide is this is a throw, pillows or some thing else. I have been auditing colours for the background but nothing I have feels right. Guess that means some more internet fabric browsing for me. I like them against the dark slate of our table. I bought the backing for my Siblings Together row quilt but have made no more progress with that. 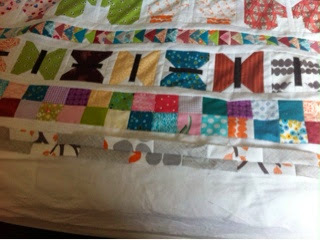 However I also bought a small fat quarter and a little bit more of Carrie Bloomston of Such Designs Collage Collection. I love the bright colour palette and the grungy arty feel. I also loved the way Eclectic Elements fold their fabric. I was itching to use some, despite the fact I have numerous projects needing finished, so decided to try Jo Avery's pattern from Love Quilting issue 9. 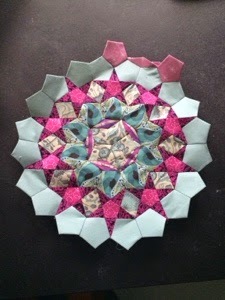 The pattern was easy to follow and all went well apart from one bit of unpicking due to my tiredness. 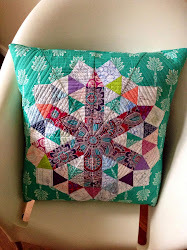 I quilted using echo quilting, as Jo had done, backed it with some more of the Collage fabric and thought it could be for my daughter's new flat. Lens Guy has other ideas, he really likes it and wants me to make more. 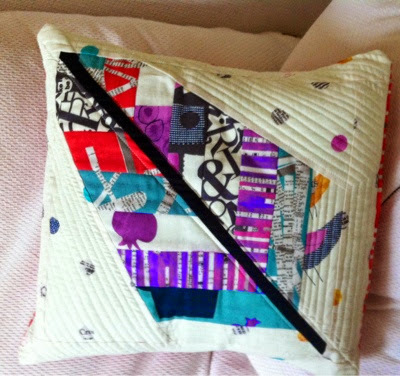 I have also found an arrow tutorial I would like to try so there may be more feather cushions in the pipeline. The back is a simple envelope back with more collage. Today is Father's Day and inevitably my thoughts turn to my own wonderful father who is no longer here and my brother as I think about his children managing without their dad. It is now 9 years since my dad died and 6 years since my brother's death and I can now remember more of the fun times and smile when I think of them both but this was not always the case. I strongly believe in taking each day as it comes and trying to find the positive in every day and most days I do this but there will inevitably be some days that are a little darker. 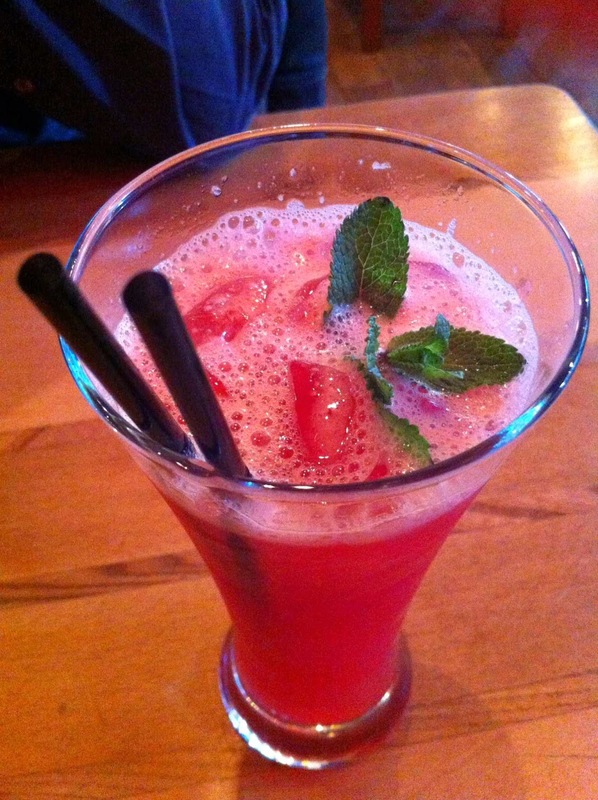 Today was not one, it has been a day of good friends, laughter and precious time with those we love. We had a lovely afternoon sitting in the garden over a very extended lunch and barbecue that was delicious after Lens Guy spent a considerable time with matches, fire lighters and the wrong type of charcoal that did not want to light but the pyrotechnics did die down to a gentle glow so we could cook - mushrooms wrapped in bacon are always my barbecue favourite. 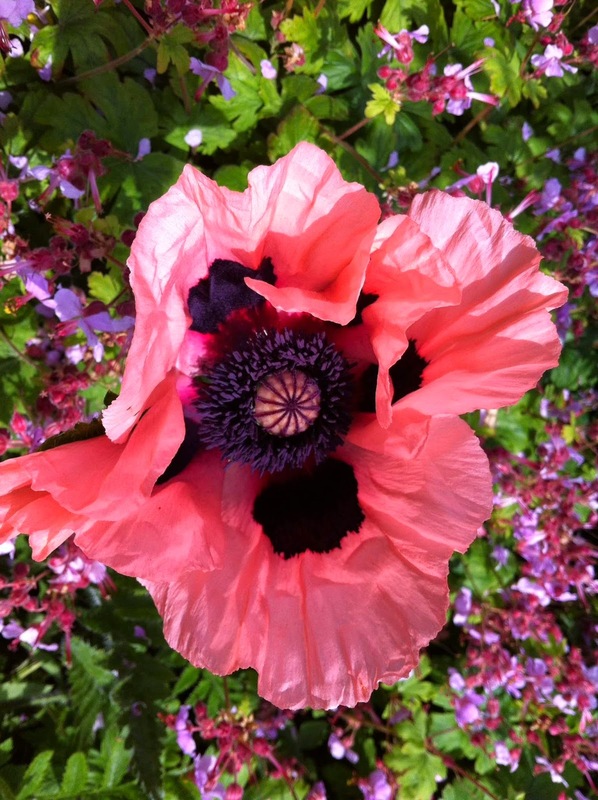 The garden continues to amaze us as new flowers burst into bloom every day. I feel so lucky to have a beautiful garden but can really take no real credit for it as all we have done so far is add the greenhouse and more plants. 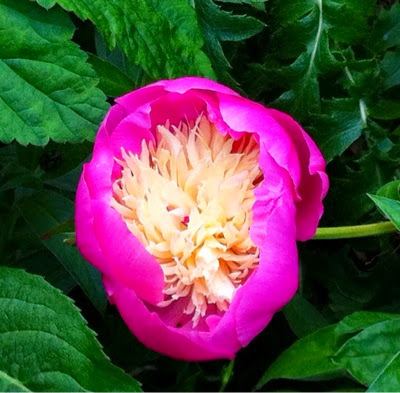 This peony is simply stunning. We have several different Acers and the pink flowers against the dark leaves is gorgeous. 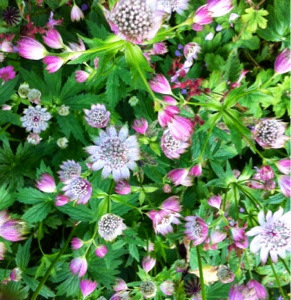 I love these flowers but don't know what they are called. 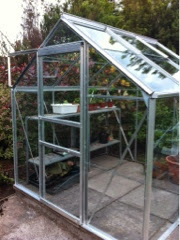 It's been a better week this week, or I'm more able to deal with stress, Lens Guy built my new Greenhouse for me and I've had fun moving my plants from the house to the greenhouse. It came with a complicated automatic window opening vent which caused much cussing and head scratching and trying to read poor written instructions. Middle son came to the rescue and now it is on and works. I came home from work, on the hottest day so far, hitting 21degrees which is very warm for Scotland, and it was wide open and magically as it got colder it closed. Simple things give me pleasure! 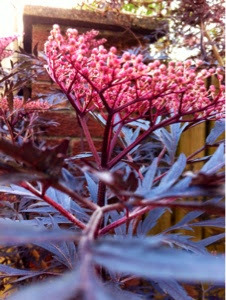 I find it incredibly soothing to potter about with plants and seeds and then hopefully eat the results,of my pottering. 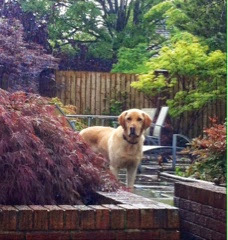 By this point Jaspar was looking at me as if I was very mad. 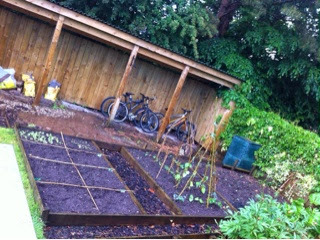 I have radishes, beet root, runner beans, sweet corn and peas sprouting and I have planted lots of lettuce,rocket, kale, garlic and spinach in the raised beds. 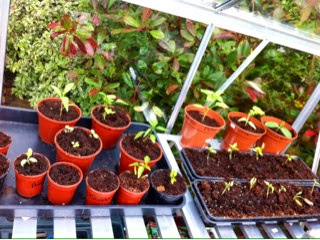 In the greenhouse I have tomatoes, chillis, peppers, cornichons, aubergine, basil and coriander. When I asked Lens Guy what he would like me to grow he was against onions as he remembers them being too much work as a child but wanted lots of salad leaves and radishes. He is not convinced by the Curly Kale as he remembers feeding it to the sheep on the farm and the same with Turnips. For those that don't know, Lens Guy is my photographer husband, who grew up on a large farm in Dumfries and Galloway. He has mixed memories about living on a farm and used to entertain our children with stories of crashing the tractors (frequently) milking cows and herding sheep which surprised our city loving kids. A few years ago we were in the car with my in laws and our youngest daughter pointed to a hair bend turn on the road and loudly said, "That is where daddy crashed Nana's mini when he was taking Uncle Robin and Auntie Rachel to school." In the silence and shock that followed she realised that this had been a secret from Granny and Granpa. We all have those. My parents were very confused when they moved from our family home to find a collection of road cones, signs and other souvenirs collected by my irresponsible teenage self and younger brother. I had forgotten all about them, we probably blamed my youngest sister. 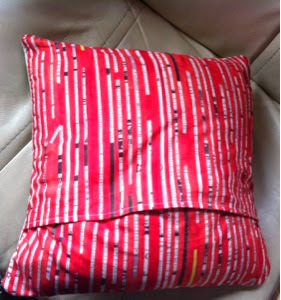 I have managed some sewing this week which always helps. I have completed two more Rose Stars. and have been working on my Sibling's Together quilt. I began this a long time ago when Lori Holt held her Bee in A Bonnet sewalong. I joined this to try and improve my skills and push myself and decided that this would be a quilt made from scraps for Sibling's Together. 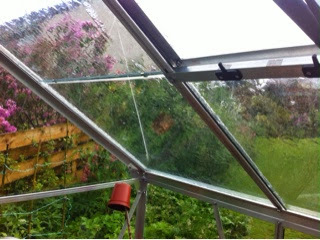 When everything ground to a halt last year it lay abandoned in my cupboard, until I took it out briefly last summer to piece the rows I had together and then abandoned it again as the rows were different lengths and needed some fixing. Another reason was that the Row along had finished and the instructions were no longer available and I had no more of the white background material. I had no idea what it was and attempts to buy more now means I have 3 types of white material. (I have learned from this and now hold onto receipts with descriptions of material in case I need to order more). 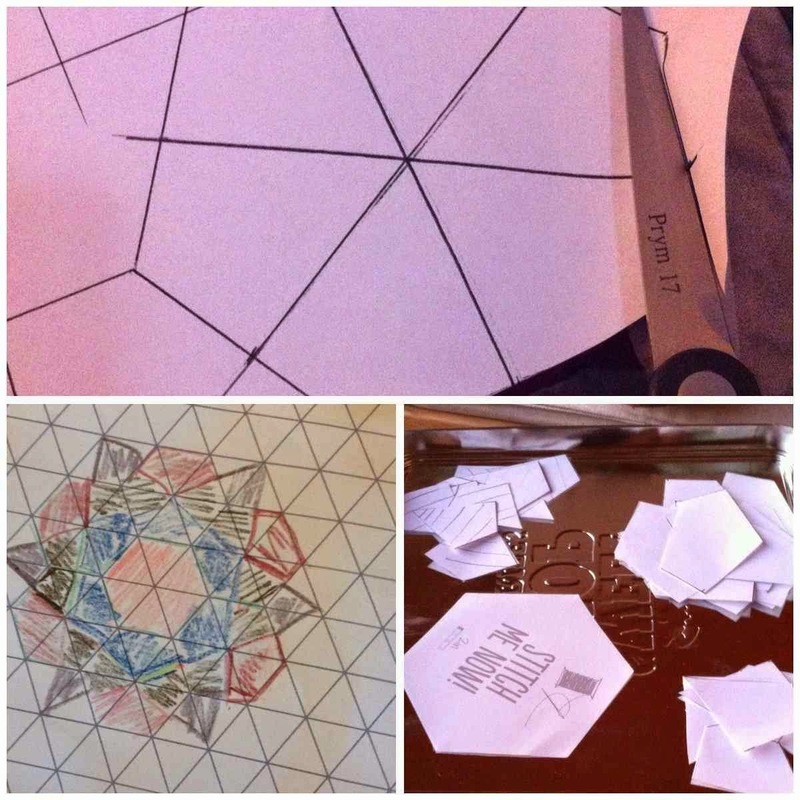 when I organised my scraps I cut a whole lot of 2 1/2" squares and triangles using my Sizzix. I decided scrappy rows of squares would work and added then top and bottom. On IG it was suggested I try another flying geese row. I had some grey crosshatch by Carloyn Frielander and after some very dodgy maths and various mistakes I found this site for calculating geese. I made a few geese, losing some points along the way and some triangles to my needle plate, auditioned them and have now decided it just looks wrong with grey. 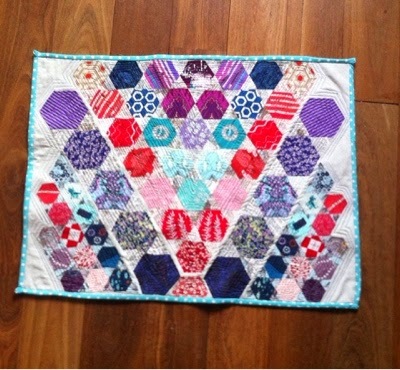 I will try totally scrappy geese or another row of squares but need to get a move on as deadlines are looming. Perhaps leave and finish might be the best option. I can then cross off another project of my WIP but it seems to be growing. I have to quilt my scrappy trip a long which is all basted but ignored as so big; make Lens Guy a quilt with solids and Tim Holt's Eclectic Elements; continue with mum's QAYG blocks; make something quilty for a friend's daughter heading to Uni in September that is gothic, quirky and probably Alexander Henry meets Harry Potter; make another EPP cushion for daughter as she loves the first one; learn to put in zips so I can make myself some bags; produce a baby quilt for a baby due in August; and on it goes but all fun and I'm not going to worry about deadlines. Last weekend was a holiday weekend and we headed up to to Camusdarach, Arisiag in the Scottish Highlands, our home from home with some good friends. The weather was beautiful but in true Scottish style you needed to find a sheltered part on the beach to enable the fleece to come off. 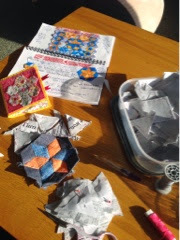 There was a lot of dog walking, staring at the sunsets and I began a new English Paper Piecing Project called the Rose Star. I had seen examples of these on Instagram #englishpaperpiecing and just had to try. 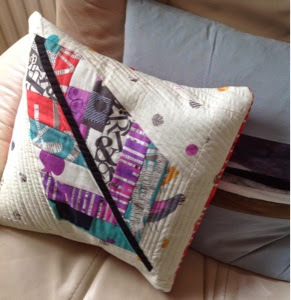 I searched the Internet and found a tutorial and introduction here on the http://selfsewn.blogspot.co.uk but the tutorial is here on her original site. I still had to figure out how to do this so I sketched on some paper and then tried to work out how to get all the pieces of paper I needed. This star ends up being 12inches from tip to tip if you start with a 2 inch hexagon, so I printed a sheet of 6 2" hexagons and got a ruler and measured out the shapes show in the tutorials above. It was a fiddle but it worked and then I photocopied my sheets. 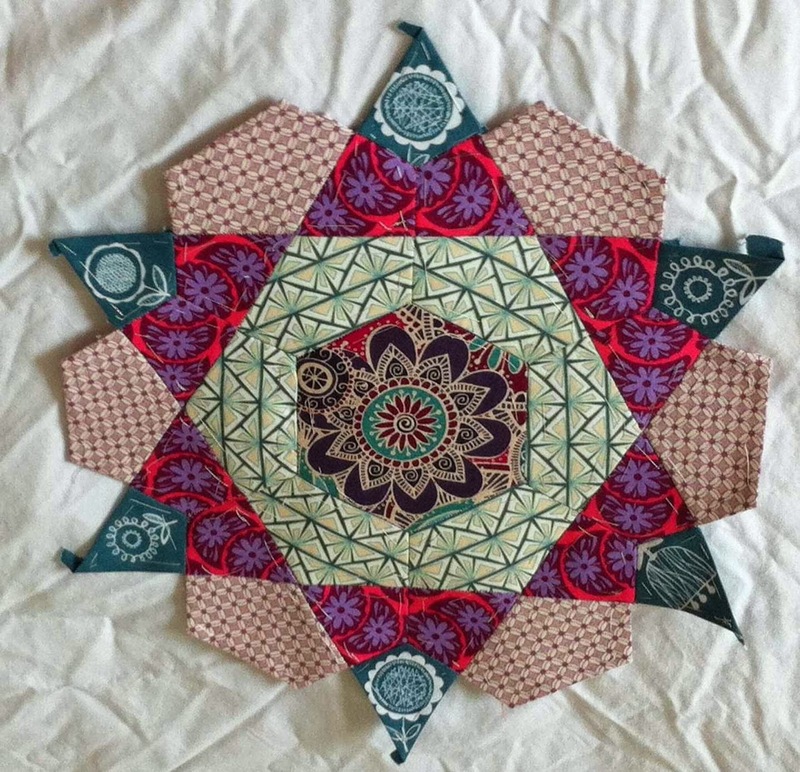 I have been working on one star at a time using fabric that began with Maureen Cracknell's blogger's bundle from Fat Quarter shop with additional pieces from my collection. 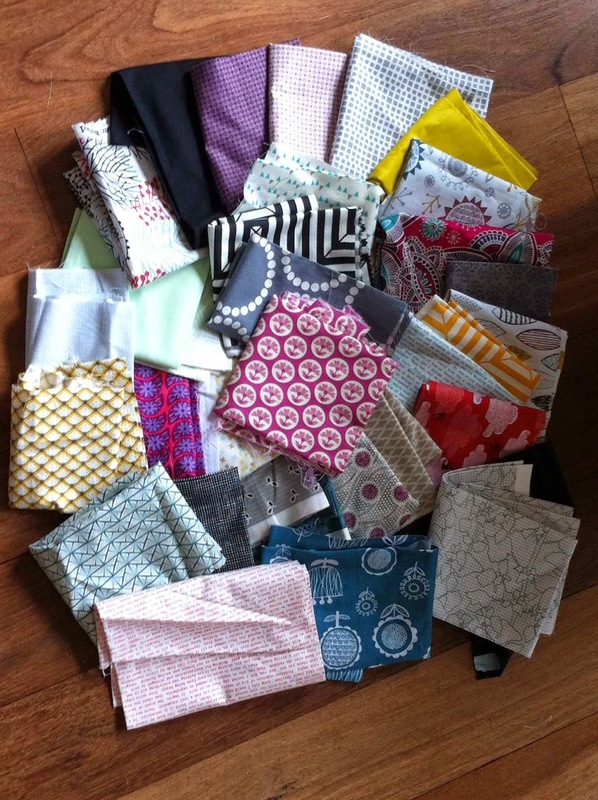 I had intended a QAYG herringbone quilt using Maureen's tutorial but when I was looking for suitable materials for my epp I grabbed this bundle as all my scraps were in the wicker basket which was inaccessible at that minute. I need to explain I have no patience and I was packing to go away at midnight on the Wednesday so I could travel up north straight from work on the Thursday to have maximum time away. 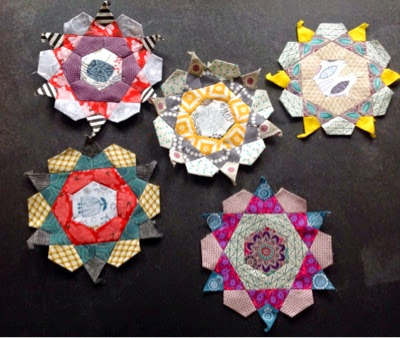 I think these stars and the bundle are going to become cushions/pillows and throws but like all my epp projects it is a wait and see game. 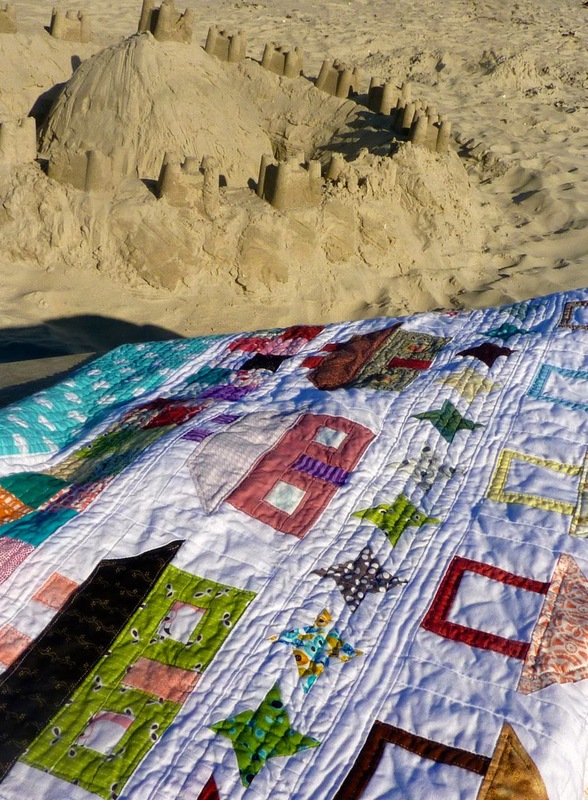 It might become one huge quilt. After our wonderful weekend away the last week has been hellish with a combination of work stress, worries about family and the usual bits of life we all deal with. I spent every night filling in an application form for a different job and then decided it was the wrong time to apply for a job further away and with more responsibility and hit the withdraw button last night. Friday night we had a wonderful meal in a Russian restaurant called Cafe Cossachok where I had a series of vodka cocktails. In the current political climate I avoided the one called "Putin's Smile" as it seemed inappropriate but overall it was a good night. 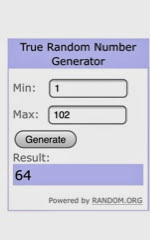 The mini I am giving away. 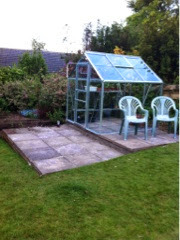 We moved to this house last summer to be nearer to my mother who needed more support. 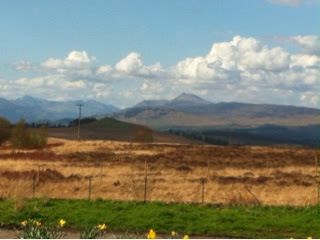 We now live in a small village in the Scottish Trossachs about 45 mins from Glasgow but near to Stirling and some of the most beautiful walks and scenery. I was always a city girl and even 10 years ago I would have rolled my eyes in horror about living in the country, but life changes and we adapt. I love living here now and it suits Lensguy, my other half, who is a professional landscape photographer. This is the view from behind our house. We moved to a smaller house with a different layout and I had to give up my dedicated craft room (which I loved). I now share a space with my other half and son called the Annexe (office/den/craft room/guest space). This is basically a granny flat in what was once a garage. It has a small ensuite bedroom which is great for guests and a living/kitchen area which is used as LensGuy's office, my craft space and middle son's place to watch TV and films in peace away from us. 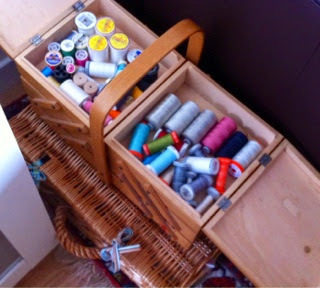 We have still not really got to grips with this space and I tend to use the kitchen area to sew. I presently sew standing up following back surgery a few months ago and although I can no sit there is not really a space to do. Partly because the dining table is full of seedlings and plants waiting to be planted into the garden. Our son, aged 23, had moved out to go to Uni, but returned 20 months ago as he could not afford to live in rented accommodation. He is an outdoor education coach who teaches sailing and windsurfing in the summer and works part time in a further education college in their gym. He is one of many on a temporary part time contract and until he has a permanent full time contract he is stuck in the country with us when he would much rather be living in Glasgow. 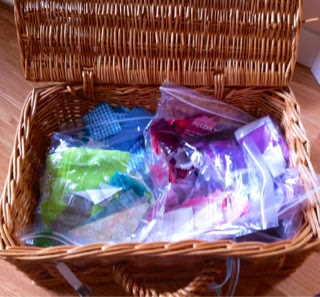 A rainbow of scraps sorted and cut into squares, triangles and strips. I keep trying to find a way to create a space that works but struggle with it as it has to work in so many ways. To help make it look less messy I spent the last two days colour coding my scraps and cutting them into squares, triangles and strings. I placed these in colour coded freezer bags inside a wicker basket which sits behind a couch with my very old sewing box on top. I will be working on more storage plans over the next while and will keep you posted. I was given my wooden sewing box as a 21st present which was a while ago, some might even call it vintage. 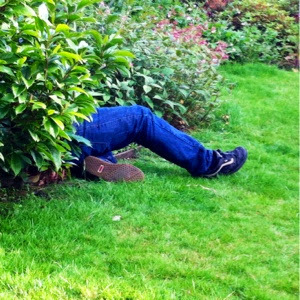 Anyway the bit people really want to know is who won the mini? I used random org and out of 102 comments it was comment 64 by Julie Glotova in Croatia. I loved hearing about what crafts everyone does and where people come from - all over the world I discovered. Julie I have sent you an email asking for your address and once I have that I will post your parcel. Here is a last photo of Jaspar who is waiting to go for a walk and is a little fed up that I am still sitting here typing on my iPad. It's been a while since I blogged as like many people life changes and priorities change. 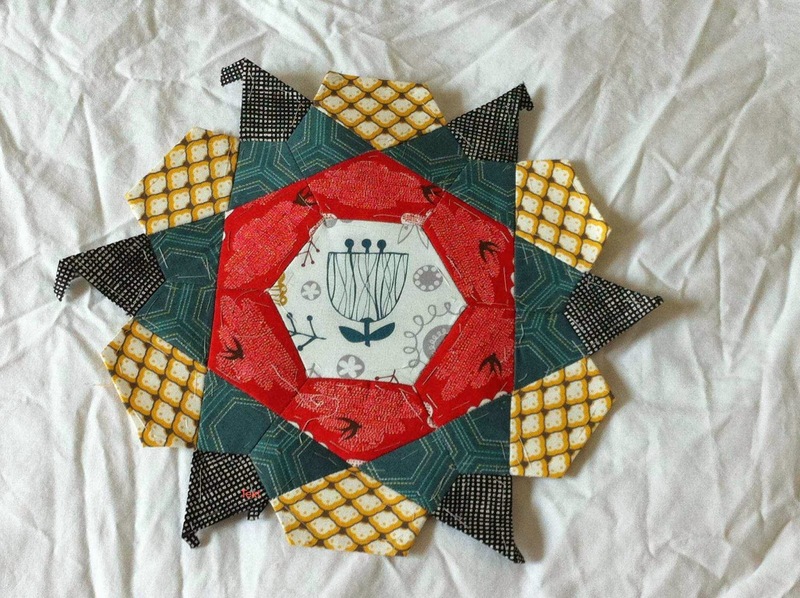 I stopped crafting for many months and when I started again it was to quilting I turned. 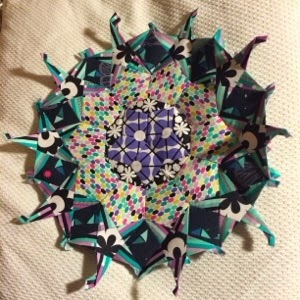 I am a new quilter and I am exploring much of the quilting world through blogs and Instagram. 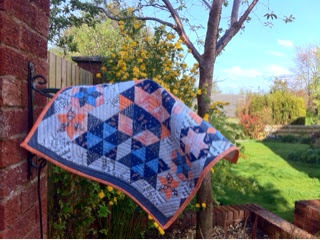 I have been thinking about returning to blogging and the sewmamasew giveaway seemed an ideal way to dip my toe back in the water. 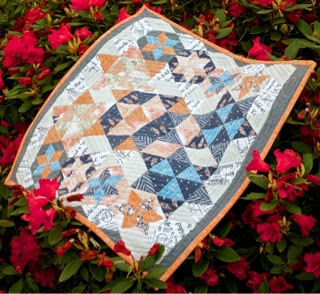 I am giving away to international entries and I've decided to giveaway this mini quilt which I designed for the Dear Stella and Timeless Treasures giveaway. 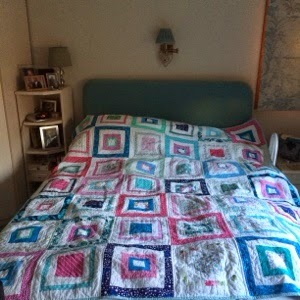 The competition was to create a mini quilt 20 x 20 inches using only their fabrics and no solids which I found challenging as it took me out of my colour comfort zone. 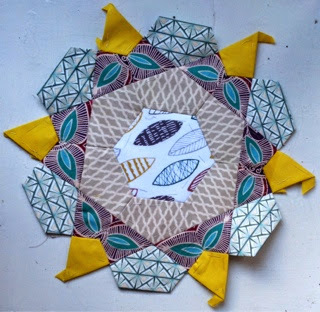 I decided to meet the brief by using English paper piecing to meet the modern meets traditional brief. 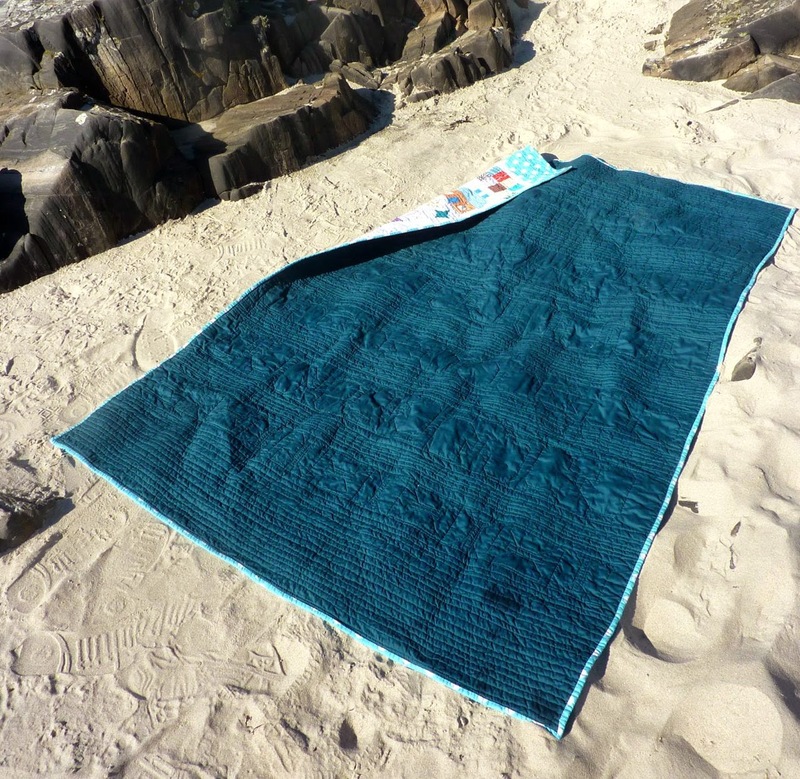 It was an interesting learning experience as this was only my second EPP project - the first being the project in the blog sidebar. If this is the first time you have been here welcome to my part of blog land. 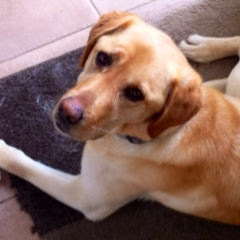 This blog will show some sewing, quilting, art journaling and photos of Scotland and sometimes my lab Jaspar. To enter this giveaway let me know where you are from and what kind of crafter you are. If you want to follow me here or on Instagram (Salamanda001) please do but you do not need to follow me to be eligible. Some other things that happened in 2013.